So much has been accomplished this week: we have sealed and installed the butcher block; sanded, caulked, primed, painted and installed the cabinets; and we have painted the ceiling. 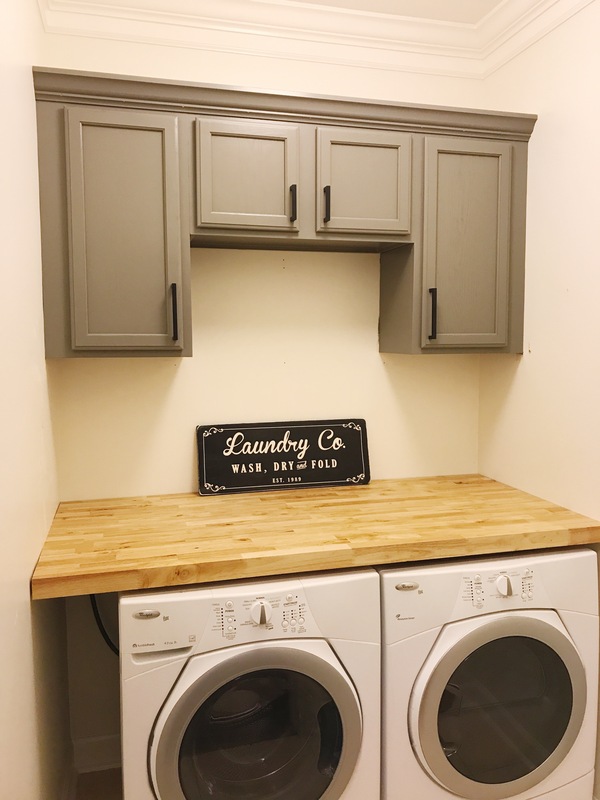 A few things that we have left to accomplish include: patch and touch-up the walls that got damaged while installing the cabinets and countertop, install the backsplash and clothes hanging bar. 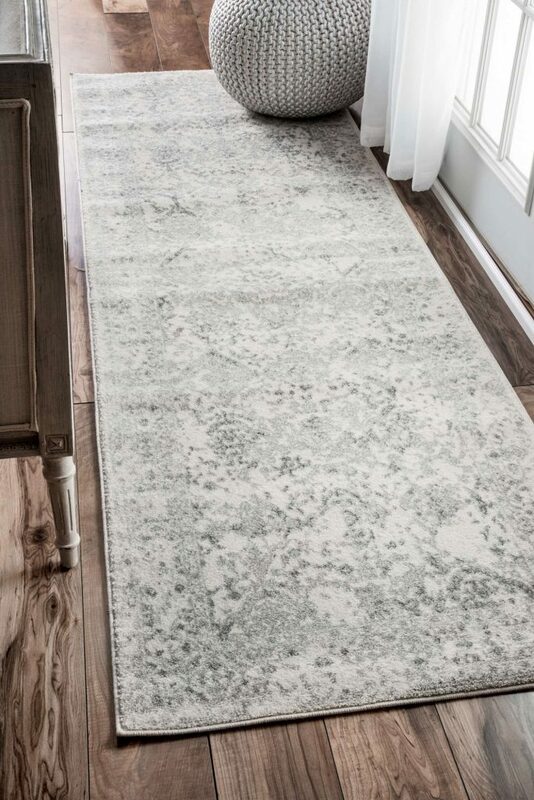 I found out this week that the rug I shared in my inspiration post is on back order and won’t be in before the reveal! 🙁 But I love it so much that it is worth waiting for! Here is the rug for those who don’t remember it from my week 1 post. 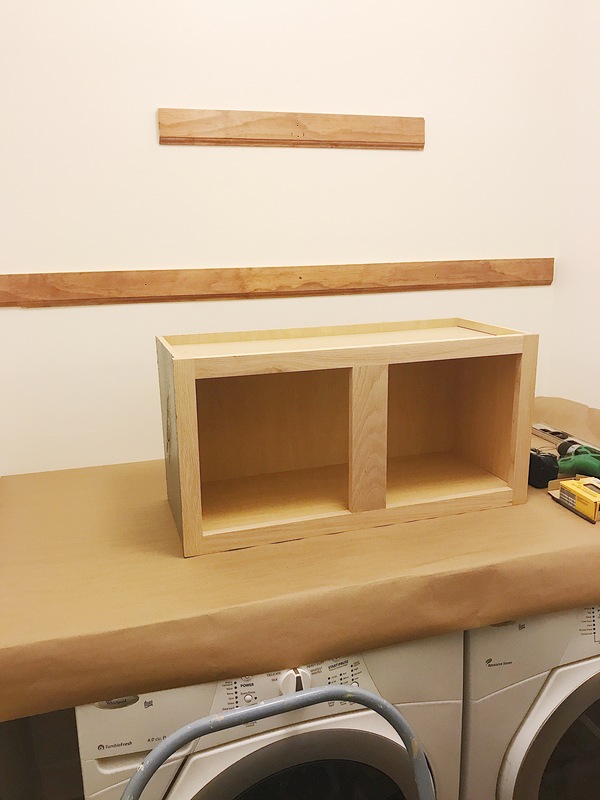 I wanted to share with you all how we sealed our butcher block countertop. 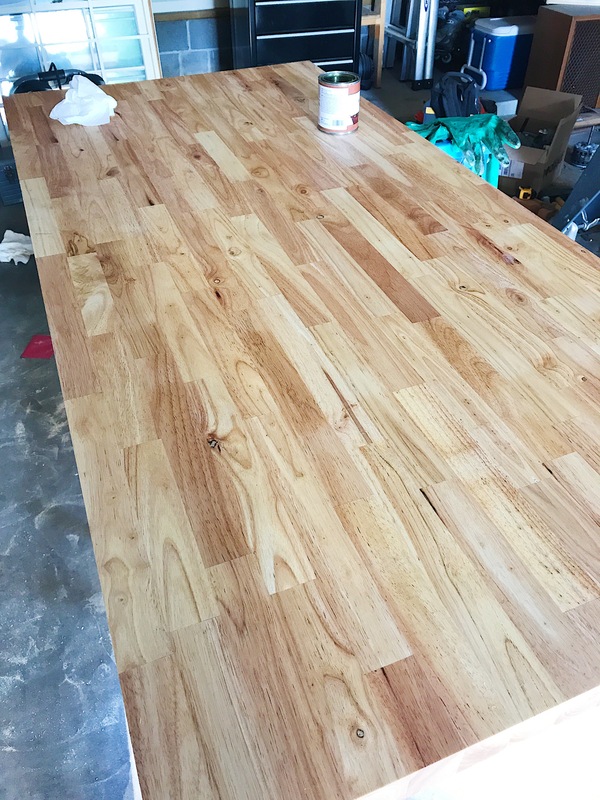 There are many products out there for finishing butcher block countertops but we ultimately decided to go with Watco Butcher Block Oil & Finish, and I have to say I am 100% thrilled with the results (I was not asked by Watco to write this review, this is just my honest opinion on their product). I know some people like to stain their butcher block, but I decided that for this particular project that I wanted to keep the finish as natural as possible. 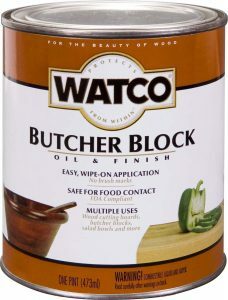 The Watco oil and finish is so easy to use and it is food-safe. You just simply wipe it on! 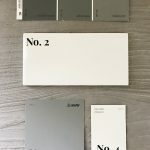 Look at the difference between the the raw wood and the wood where the finish was applied (please excuse the low-resolution of the above image). You can see it brings out the grain nicely and adds a warm tone to the wood! 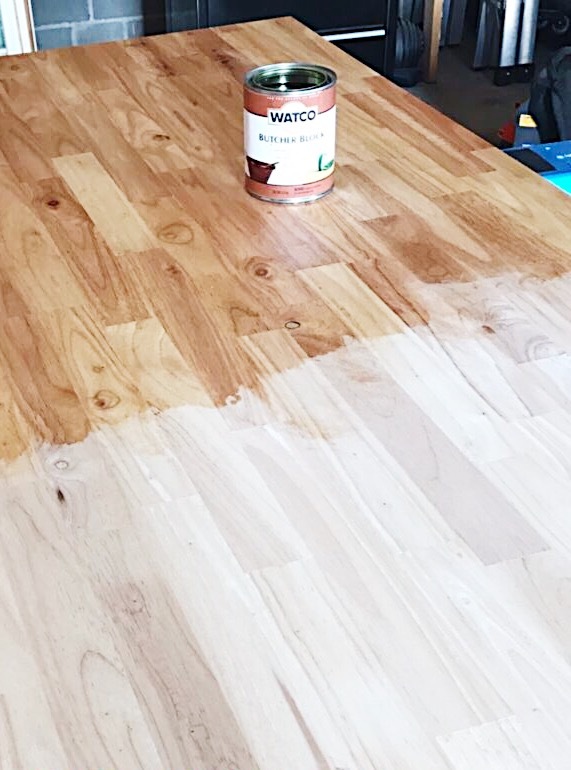 Before applying the oil make sure you have sanded down the top of your butcher block to remove any rough areas, then wipe it down thoroughly with a damp cloth to remove any dust before sealing. Apply oil and allow to dry, then lightly sand with fine sandpaper between coats. Make sure to wipe the surface down really well before reapplying the finish. One final tip, which we were told when we bought the countertop, is to seal the entire piece (everything-top, bottom, and sides) to keep it from warping and give it the best protection against moisture. 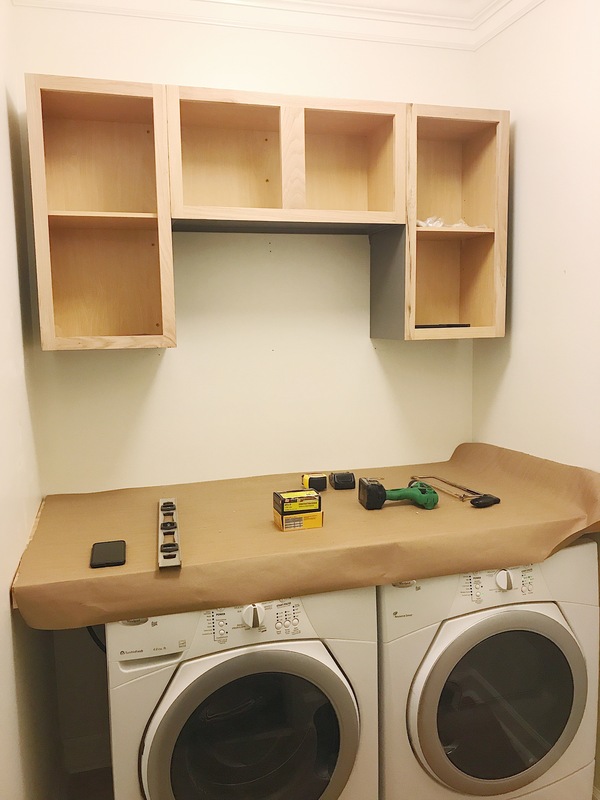 We got the cabinets installed this week and I wanted to share that process with you all! 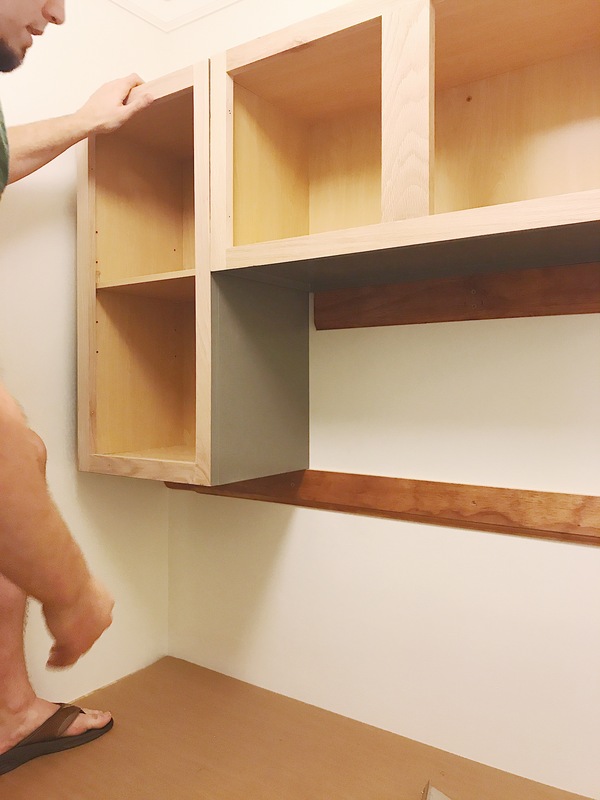 We watched a tutorial from Lowe’s on how to install upper cabinets, we found it so helpful that we referred back to it several times during the installation process. I will be writing out a few of the steps that we took, but for a full tutorial I definitely recommend viewing that video! 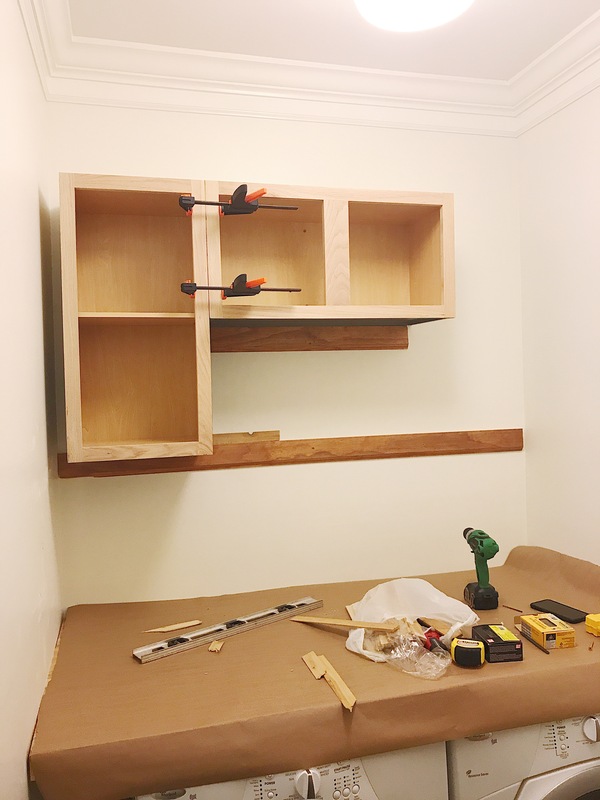 The first step was to install some ledger boards at our desired height, to support the cabinet while hanging them. Since we have cabinets are two different heights we had to install two different height ledgers. Once those were secured we were able to install the first cabinet! We used some wooden shims to to shim behind the cabinets as needed to get them level and flush. Next, we secured the cabinet into the stud with some wood screws. We install the left cabinet the same way as the other one, set it on the ledger for support, used shims to get it flush, checked that it was level and secured it into the stud. For extra support we used clamps to hold the cabinet in place while we secured it to the wall. Once secured to the wall we secured the cabinets to each other. Repeat again with the next cabinet! When all the cabinets were installed, we removed the ledgers boards and used a razor blade to trim the shims flush. 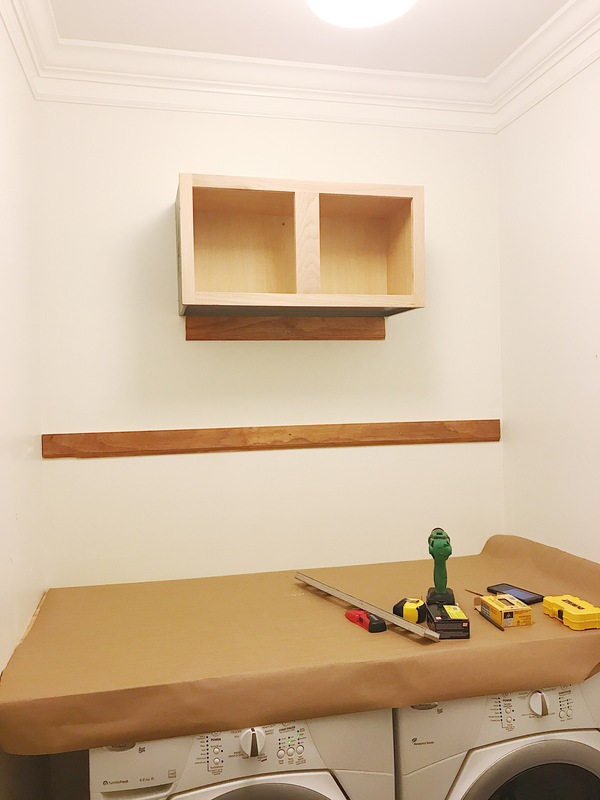 One final step was to add the filler strips at the ends of the cabinets to fill in the gap between the cabinets and the wall. To finish off the cabinets nicely, we also decided to add a strip of crown molding at the top to give the cabinets more of a custom look! We simply tacked it in along the top using our brad nailer. What do you think of this week’s progress? Leave a comment and let me know! it is looking so awesome! 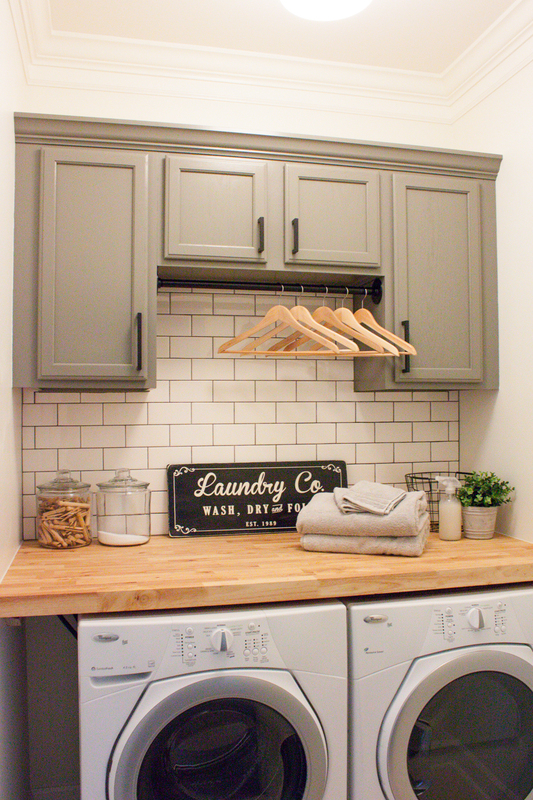 the countertop is gorgeous! Thank you Cassie! I am loving it!! I stop and stare at it every time I walk by! LOL! Can’t wait for the tile! Nice progress I love the butcher block countertop!! 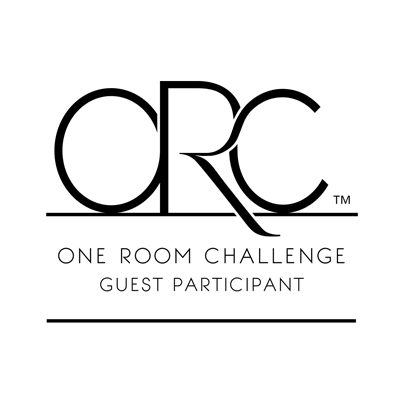 Can’t wait to see your final reveal next week!! We are almost there!!! Thank you Jennifer! Can’t believe we are almost done! Thanks Emy! 🙂 It turned out really well! I am happy with it! Looks great! I love butcher block too. We use mineral oil on our wood island counter top. 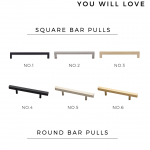 This product is interesting, thanks for the review! Yes I thought about mineral oil also, but I read about this product and wanted to give it a try! I’m really happy with the results! 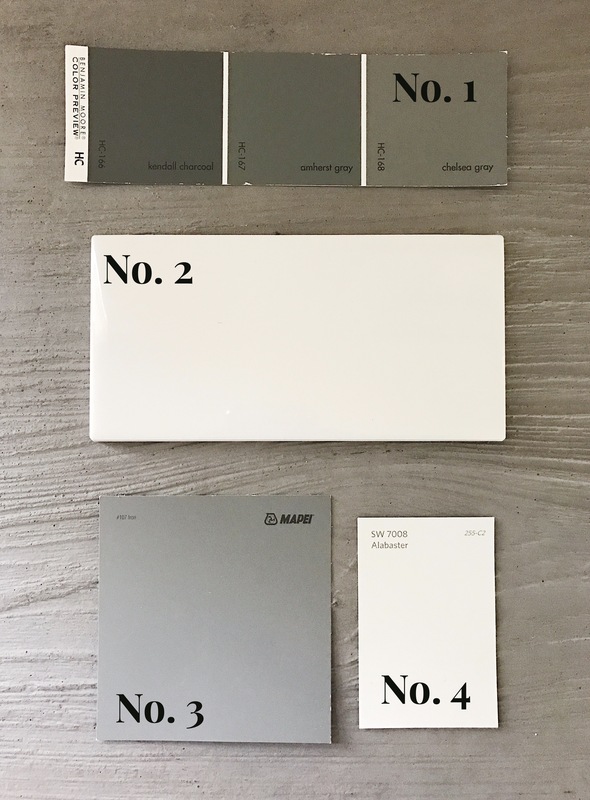 I love the color you chose for the cabinets!! You’re so close to being finished. It’s going to look so great! Thanks Diana!! I’m loving them too! It’s a beautiful color in person! It looks amazing, you’ve made so much progress! Hey Jessica! I know this week we really worked hard! That progress was the results of A LOT of late nights! LOL! 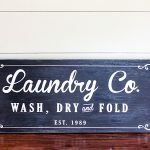 GIRL – You got some serious DIY skills – I Cannot wait to see the REVEAL!!!!! haha Lesli! Thank you, but it’s mostly my husband! He is the brains and the brawn, I just make it look good! LOL! Love it! Where did you get the butcher block from? Hey Cheyenne! Thank you! We bought our butcher block at a local place, Southeastern Salvage. But I know places like Lumber Liquidators sell butcher block in all different types of wood. 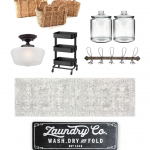 I love how your laundry room is coming together. The butcher block is beautiful. I can’t wait to see the reveal. Hello! 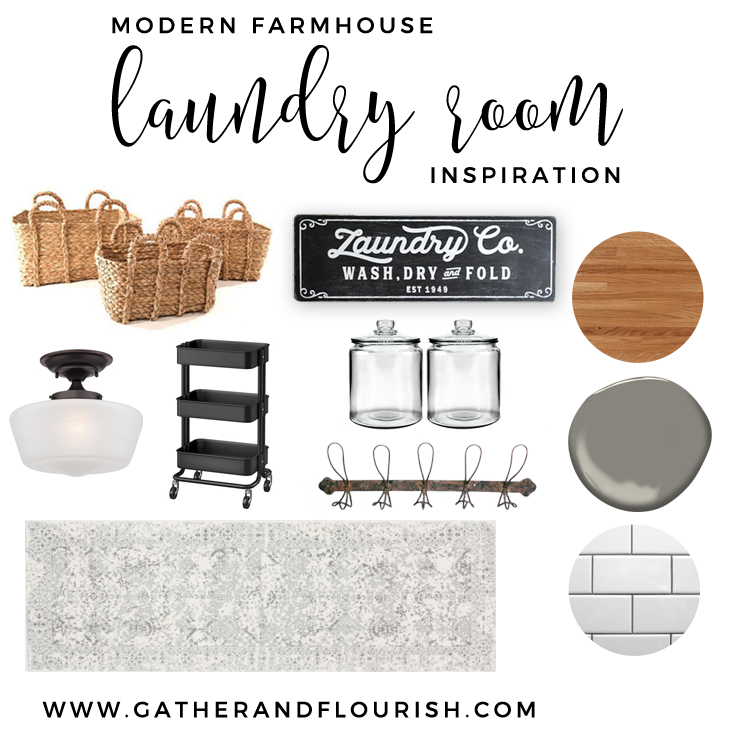 I am using your photo as inspiration for my laundry room!!! I seriously LOVE this! I was wondering if y’all made the cabinets yourself or did you go to lowe’s and give them dimensions and have them make them for you? Hi! I was also wondering where you purchased your cabinets? Beautiful! Any chance you know the height and width of the cabinets still? You space looks like almost the exact same size as mine! Can you please explain a little more how you added the filler strips? Love the look of cabinets and butcher block!! Hi Ashley! 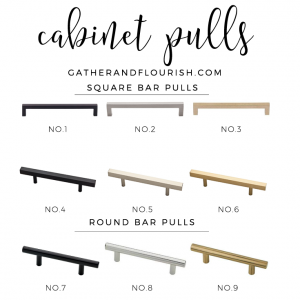 This video from Lowe’s is what we watched to learn how to install the cabinets and the filler strips. I could try to explain it, but I think watching the video will be the most helpful! 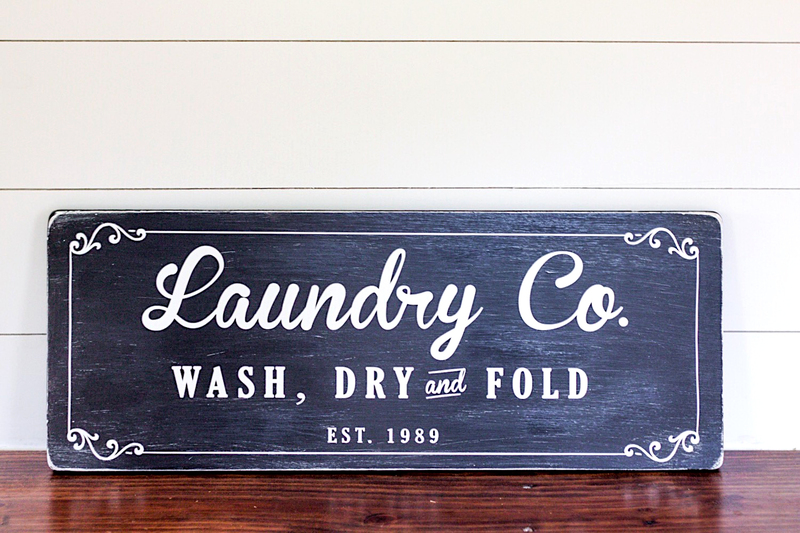 Hi there – since you’re a little over a year and a half out from this post, I was curious how the butcher block is holding up with the product you used to seal it.. and also, if you’ve had any issues with your clothing being on it? I’m so nervous about anything with oil ruining any clothes sitting on top of the countertop.